We never quite knew whether it would come to this, but yes, Minecraft 1.13 support has finally arrived in the main Overviewer branch. This was thanks to the hard work of gmcnew, RedSparr0w, jvaskonen and agrif. You can grab the binaries as usual on our downloads page. 2019 marks the ninth year of Overviewer's long and varied history, which means that we probably have people looking at Overviewer maps now that are younger than the project itself, which is impressive! During this time, 2553 commits have been made to the repository by 108 contributors from all over the world, for which we are incredibly grateful for. If you need help with Overviewer or just want to say hi, you can reach us on IRC or Discord. 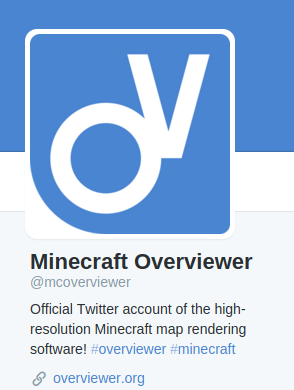 We also have a Twitter account, @mcoverviewer, if you're into that. However, Google started restricting their API, forcing all new Overviewer users to get a (free) API key from Google just to use one JS file. Just a few days ago, Google has announced that they will require everyone to sign up with a credit card to make use of the Google Maps API, which is unacceptable for our use-case. Therefore, Overviewer now uses Leaflet, a free as in freedom map framework. In addition to our users no longer requiring Google Maps API keys, this also means that maps can now be viewed without an internet connection, and are smoother to use. Furthermore, we're now no longer at the whims of Google, who have proven to be bad to rely on. Some features may still be missing from the Leaflet version, but all in all we believe it is a very usable experience. If you notice deficiencies, feel free to submit a pull request or open an issue. While most of us were probably busy spending time with our Valentine today, some of you may have noticed that the downloads have been unavailable for the last few hours, which was a result of unintended data loss after an upgrade. Fortunately, we could restore the important bits and the website should be fully functional once again. We apologise for the inconvenience. In unrelated news, did you know that we have a Twitter account? That's right, you can now follow @mcoverviewer on Twitter if you wish to stay up-to-date with future incidents such as these. We might also use it for other things. Note that people currently using our RPM repository will likely have to add this key to RPM before they will be able to verify and install the new packages.